Our knowledge and newest technological equipment allow us to perform the majority of needed radiography (X-Ray) tests. At Granada Veterinary Clinic we have Radiograph equipment for both orthopedic/soft tissue cases as well as dental radiographs. 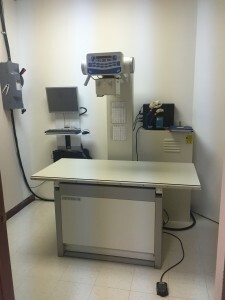 All of our Radiography equipment is digital which allows us to have results within minutes. Other advantages include decreased radiation exposure, enhanced X-Ray image quality and easier to share between Veterinarians. If the radiograph’s need an opinion of a board certified Radiologist they can be easily emailed and reviewed. If you have any questions in regards to Digital Radiography please don’t hesitate to contact us or if you would like to Book An Appointment to consult with one of our experienced Veterinarians.